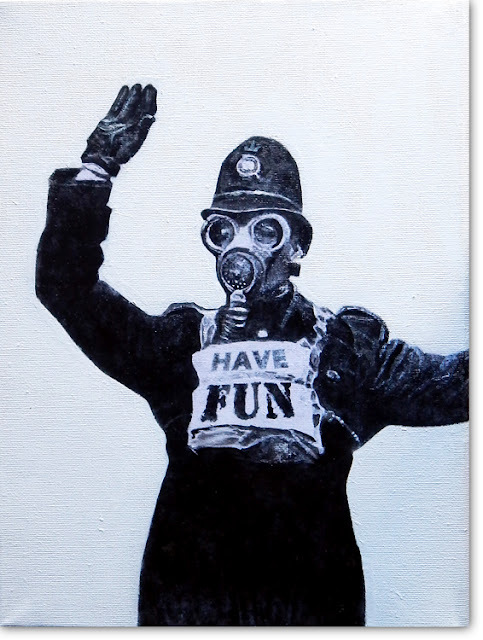 Have Fun is a Painting from a series of found images of gas masks. Its about 30 x 24 cm on a stretched canvas in black and white and varnished. The contradiction of the the gas masked policeman with the words Have Fun abstracts from the thought police of the 1984 Novel by George Orwell. The thought police is a concept where your decisions and day to day life is governed by authority figures who criticize and correct your thoughts away from deviation. The message is conformity it doesn't matter whether its right or wrong, not dissimilar to Freud's super ego theory. Or it might just be good advice. Have Fun . . .